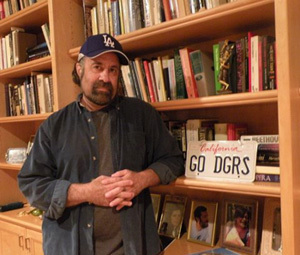 BaseballSavvy.com Managing Editor Howard Cole is a lifelong Dodger fan, the son of Brooklyn parents. Born in what is now the Scientology building in east Hollywood, about which he used to say was “a Mondesi's-throw from Dodger Stadium.” Now he just whispers “Scientology” and leaves it at that. Cole was at Dodger Stadium for Sandy Koufax’s perfect game in 1965, but has no ticket stub to prove it, nor any recollection of what transpired, whatsoever. His older brother, a religious man, reassures him of his presence at the event every so often. Actual verification from the Kirk Gibson game sits in glass next to his keyboard. He is 5’ 9," weighs 175 and chews Juicy Fruit. We’re a short roster right now. If you’re a writer who drips baseball, we’re interested. If you have an edge, even better. Queries for our "Where Are They Now" feature are especially welcome. If you are a real, live baseball industry person, player or former player, we'd especially like to hear from you. BaseballSavvy.com is a place for you to sound off. If you have a big mouth like, say, John Rocker, but are not John Rocker, we can probably give you a forum. We can pay you peanuts...Sometimes Cracker Jack.